Enjoy DCI 4K images in vibrant color with the Sony VPL-VW995ES HDR DCI 4K SXRD Laser Home Theater Projector. 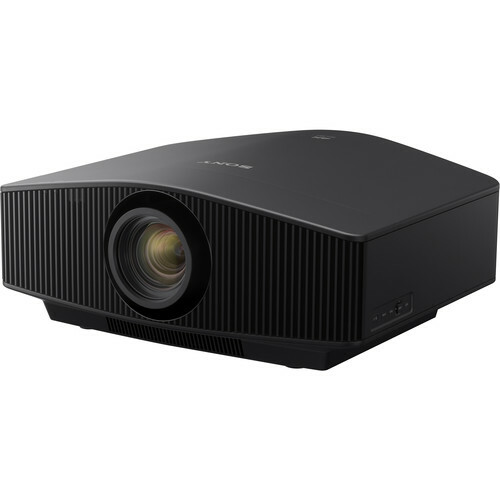 Its three SXRD chips combine with HDR compatibility to deliver enhanced color accuracy, while its 2200 lumens of brightness from the laser light source help ensure that your images are clear even with some ambient light. This projector uses interchangeable lenses, and includes a lens with a 1.35 to 2.9:1 throw ratio. The VPL-VW995ES has two HDMI inputs for connecting your digital HD devices, such as your HD cable/satellite box or Blu-ray player. It is 3D compatible and will connect to many RF-based 3D glasses. As an added convenience, the projector includes a remote control. The VPL-VW995ES combines a laser light source with 4K SXRD panel technology. Native 4K offers 8.8 million pixels for an image with enhanced realism. With up to a 2200-lumen brightness output and a wide dynamic contrast ratio with Advanced Iris, 4K images show clear highlights and deep blacks. Dynamic laser control and the Advanced Iris feature work together to help deliver enhanced image quality. The ARC-F lens features an 18-piece glass lens design to faithfully transfer images from the imagers to the screen. The Digital Focus Optimizer is designed to actively refine and correct image quality while you watch. Separate imagers for red, green, and blue channels help provide full, rich color. The panels also help produce deep blacks by enhancing the flatness level of the pixel surface. HDR compatibility provides a wider contrast range with higher brightness levels and color volume. This mode allows clipping to help provide brighter pixels for richer gradation in bright parts of the scene while retaining HDR quality. Motionflow helps on-screen action appear smooth at all resolutions. The laser light source provides up to 20,000 hours of illumination, so there's no need to worry about lamp replacement. The Reality Creation 4K upscaler is designed to analyze every pixel in an image and employ a digital signal processing algorithm to map pixels against a picture patterning database to enhance colors, contrast, and textures without enhancing image artifacts. Store lens focus, zoom, and shift settings for up to five screen formats for easy recall. Picture Position Memory remembers key settings so you can quickly watch movies in the correct format for the screen. Match aspect ratios, including 16:9 and CinemaScope, and store these settings in the projector. The VPL-VW995ES can project native 4K content at up to 60 fps thanks to HDCP 2.2 compatibility, allowing you to enjoy 4K video from a range of compatible sources, including gaming consoles. Reduced input lag creates a better response time between control input and on-screen action, making video games seem to perform better. The wide lens compatibility of the VPL-VW995ES enables you to use your existing anamorphic lenses, even with 4K content. The VPL-VW995ES incorporates TRILUMINOS color to help reproduce crimson reds, aqua blues, and emerald greens, helping landscapes and seascapes look more vivid and skin tones seem more faithfully reproduced. A 3D RF transmitter synchronizes optional glasses with the projector so you can watch 3D movies. The emitter is designed to provide a strong signal nearly anywhere in the room. Upscale 2D films to 3D and enjoy classic movies in a whole new dimension. If you need to install the projector near the screen, an optional short-throw lens is available. Box Dimensions (LxWxH) 31.0 x 27.0 x 17.0"